Whether you’re intimidated, overwhelmed, out of the loop or just plain don’t know, Omaha’s growing visual art scenes can be challenging to navigate. We’re going to take you through an alphabetic journey to learn about the hidden gems, with helpful tips, and easy ventures to get you out to the galleries and part of the art world. Adopt Art Omaha– “Please Adopt Me”, the tag says on a wooden dog cutout sitting on a park bench. This dog is one of dozens painted by Omaha artists for a project created by art lovers Laura Vranes & John McIntyre. They give notice of a drop-off location on Facebook & a new original artwork can be yours for the taking. Buying – Building an art collection doesn’t have to be scary or expensive! The first rule is: buy what you like. Don’t worry if it will be valuable. The next rule is: get out and look at art. Different galleries & venues tend to specialize in certain types of art/artists. If you venture to places you aren’t used to–especially if you don’t think you’ll like it–you’ll discover new things to catch your eye. If cost is an issue, look at prints and check out student shows. You’ll usually find a lower price point but good quality. C(ommunity) S(upported) Art-Membership in Omaha Creative Institute’s newest program includes nine pieces of original artwork from emerging and established Omaha metro artists. As a $300 shareholder in CSArt, you can build your collection and support artists directly. This year’s first go at this sold out in an hour, so be ready for next spring’s new group. Drink & Draw – This group holds monthly events open to people at all levels. They provide live figure models and an opportunity to meet and get feedback from other artists. Sometimes there’s even a theme to keep it interesting. Often held at the Apollon Art Space; you can find their events on Facebook. Economic Impact – Did you know that Omaha’s arts community contributes $90 million in direct expenditures, affecting 3,431 full time jobs, and contributes $9.1 million to local and state government- approximately half of the state’s arts economic activity. For every arts job created in America in 2012, an additional 1.62 positions outside of the arts were created as a result. Artists are job creators and every time you attend shows and enjoy what your city has to offer, you help support a tremendous component to our economy. Fashion – Step away from the khakis! Talented designers are abundant in Omaha-many are graduates from local colleges & universities. Omaha Fashion Week has boasted nine years of introducing local talent and you can find their unique and affordable products in stores like Curbside, Hello Holiday, True Blue and online at Etsy. Giving – Omaha Gives is an annual online fundraising event hosted by the Omaha Community Foundation. There are 28 visual arts nonprofits alone that you can donate as little as $10 to. It’s amazing how dollars add up to help these organizations carry out their missions. Take part on May 25! Hundred Dollar Auction – If you’re still sad about being outbid for Rothko’s No 6 (sold for $186 million), then maybe this isn’t for you. 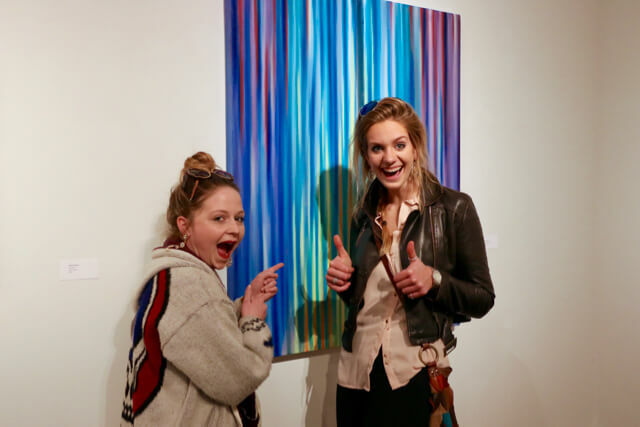 But if you like collecting local art at an unbelievable price, then checking out one of the $100 art auctions at The Union for Contemporary Art or Project Project may be right up your alley. These fundraiser events draw work from both emerging and well-known area artists, so it’s the best opportunity to snag something really special. Be prepared and go early, though; pieces can go quick. Independent Curators – You may think of the curator as a mastermind who pulls the strings and produces the exhibits you love. Well, that’s true but a curator’s job involves a lot of support, a lot of labor and a lot of love for art. Outside of galleries & museums, independent curators are working with venues to put on exhibits that may not have a home in a traditional space or within a traditional schedule. Jobs in the Arts – The idea of a starving artist is really outdated. Arts organizations are growing every day and jobs in the arts are as numerous as ever before. You can create art & sell it through galleries and commissions. You can support artists by being in administrator for a nonprofit. You can teach, organize programs, fundraise, design marketing materials and more. Kent Bellows Studio – This mentor program works with about 50 high school students each semester to build technical skills & build their portfolio. Student exhibitions run every April/May (ends May 14! ), August and December. Their annual fundraiser, Wishbone, takes place in March and is a great opportunity to support this program while interacting with the students. Lake & 24th Streets – A visit to this ever-growing corner in North Omaha lets you in on a mixture of art and spoken word with the residencies at Carver Bank, a night of music and performance by African American artists at Love’s Jazz & Art Center, and an abundance of youth and community programs at the Union for Contemporary Art. Memberships – Want to really support artistic endeavors and get access to all the best stuff? Buy memberships to your favorite nonprofits. Benefits can range from free parking to class and ticket discounts to party invites all the while helping them put on programs that keep art going in Omaha. The Union for Contemporary Art’s unique Co-Op membership lets you have access to their dark room, screen print and ceramic studios, and wood shop with assistance from their staff. New Media – It’s not a painting or sculpture or photograph. New Media tends to be a catchall of any art form that doesn’t fall into a traditional category. You might find video & digital work, sound or performance here. Next time you’re viewing one of Jamie Hardy’s light installations, for example, think about the experience you are having with the medium-not necessarily what you are seeing. Openings – If you’re intimidated by galleries, opening night for exhibits is one of the best opportunities to check out new art. The movies always depict them as snooty but they’re fun, free and usually offer up good snacks. Plus you can talk to the artists & hear their own words or blend in to the crowd if you want. Look for openings on First Fridays in Benson, Old Market and some Midtown locations. Friday 2 (2nd Fridays) on Vinton Street. Other galleries have openings throughout the month. Pop Ups – You may have heard about pop ups for children’s books & ramen noodles, but pop ups have their place in visual arts, too. Shows can be as short as two hours to two days, like the May 20 1-night only event at Cali Commons hosted by Random Arts Omaha. Questions – They always tell you art is subjective-and it’s true-but your opinions and knowledge can get a boost when you approach it asking these questions: How does it make me feel? What does it make you think of? Why do I think the artist did that? Have your kids go at it with the same approach, too! Re-Installing – What’s old is new again. The Joslyn Art Museum’s European Collection is getting a new look this year thanks to curator Dana Cowen. By bringing up items from storage and adding in new pieces, this collection of 16th & 17th century master works will give a fresh look to the European wing. Studios – Seeing into artists’ studio spaces gives you a chance to see how they work and an opportunity to get to know them better. Individual artists and organizations that support often hold open studios where you are welcome to come in and have a look. Hot Shops Art Center is 3 floors of artist studios that you can wonder through. Building relationships with artists is the best way to follow their career, have access to their new work, and support their efforts. Try it Yourself – Need some baby steps to get into art making? Take a sketchbook and head to your favorite places. Go ahead and copy that Rembrandt at the Joslyn, take photos at the zoo. When you’re feeling a little more confident, you can find beginner-level classes at the Union Co-op, Omaha Creative Institute and even through Metro Community College. Underground – A plethora of talent is popping up in non-traditional venues using non-traditional mediums. Underground art emerges outside of traditional galleries and museums and supports new artists with opportunities for shows, mural work and graphic projects. The annual Abstract Concrete Graffiti Throwdown is held in the parking lot of the Bancroft Street Market in August and has teams of spray artists competing against the clock to create original work on concrete traffic barriers. Volunteering – There are lots of ways to support art organizations by being a volunteer. Find your favorite nonprofit and learn about ways you can help. You can do anything from provide snacks to Kent Bellows sessions to taking tickets at Film Streams to helping set up Bemis’ big fundraiser. Walking Tours – Public Arts Omaha has supported art projects across our city since 2009. You can stay informed of organized tours or do one on your own. A 22-piece tour is designed and available on their website or download the Public Art Omaha mobile app. waX– This unassuming product is finding its way into several Omaha artists’ portfolios. Used with pigment in Encaustic painting or to create a surface for mixed media, the textural result can create complex and beautiful works. Look for Lori Elliott-Bartle in her studio at Hot Shops, Jody Boyer teaching at UNO, Metro or at Norris Middle School and Margaret Berry who offers workshops to the public. Young Art Patrons – Joslyn Art Museum offers a membership level designed for those in the 20-40(ish) range. The $100 (for 2 people) membership gets you free and reduced access to the YAP Field Trip, Art Crawl, Art Class and Glow in the Garden party in addition to all of Joslyn’s member benefits. It’s a great way to experience Omaha art and meet new people.